It’s a trade that has haunted the Mets for decades: looking for solution to their third base woes, they drew from their surplus of starting pitching and traded Nolan Ryan for Jim Fregosi. 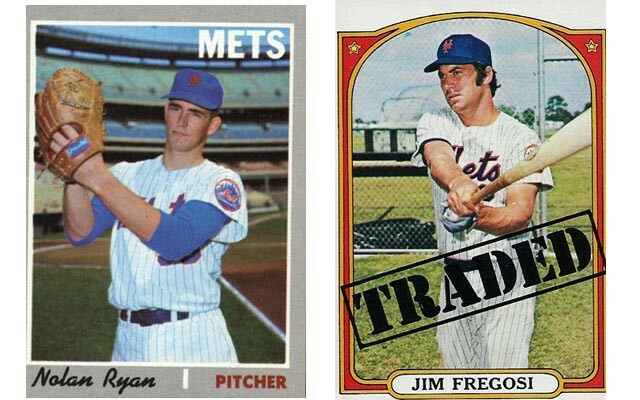 Ryan went on to a Hall of Fame career, while Fregosi didn’t even last two seasons with the Mets. Although the trade was made in 1971, it took until 1984 and the arrival of Doc Gooden for the wound to stop bleeding. Time has dimmed the memory of it somewhat, with flare-ups in 1999 and 2004, along with the Mets (not surprisingly) picking at the scab themselves with a Ryan bobble head giveaway recently. Fast forward to the present. As they did in the early 1970’s, the Mets once again have a seeming surplus of prospects. They also have several holes. Alderson has frustrated Met fans with long stretches of inactivity, especially during the offseason, when fans are desperate for any type of news. Imagine for a moment however, if Alderson had succumbed and made a trade like Lucas Duda to Tampa Bay for Matt Joyce. A move that would have been hailed as a triumph in March would have resulted in Alderson’s resignation, rather than his contract extension, in September. What’s that old saying about listening to the fans and eventually sitting with them? This concept was already covered here, but where past Met GMs like Steve Phillips or Frank Cashen were bold, occasionally getting burned but also with spectacular successes, Alderson makes his moves from a defensive position. Credit where it is due, he made the right decision with Duda. The Mets have to hope that this season was the start of something big for Lucas and that they aren’t being fooled the way Ike Davis fooled them in 2012. This also means that Alderson is likely to give Wilmer Flores and Matt den Dekker the starting shortstop and right field jobs, respectively next year. Not that either is underserving of the opportunity, as both showed flashes in their extended 2014 trials. This is a high-risk/high-reward proposition for the Mets. If both players (and Duda) are successful in 2015 and enough pitchers stay healthy, it isn’t too hard to picture the Mets as contenders. If however, they falter, the rebuilding is dealt a serious setback and yet another year of David Wright’s prime and cheap young pitching has been wasted. One name that will no doubt come up frequently in the off season (at least until he is traded) is Yoenis Cespedes. Two things to remember: we’re in a post-PED world and power hitters are the new young pitchers, that most coveted of resources. Second, Boston traded Jon Lester to get Cespedes, so it is very unlikely they are going to accept a package of Daniel Murphy or Dillon Gee and a few “B” prospects for him. This all means that Boston is going to want at least one of the Mets late inning bullpen power arms, plus Kevin Plawecki and at least Steven Matz. Just because Ben Cherington wants to remind us how smart he is, he’s also going to demand a lesser-heralded, but intriguing arm like Matt Bowman. Would you make that trade for one year of Cespedes? More importantly, would Alderson? Back Mets Games 160, 161, 162 – Wait ’til Next Year! Cespedes had an OBP of 301 this year and 294 last year. He’ll be 29 in 2 weeks, he’s not getting better. He had 22 homers last year in Oakland and Boston (as a righty who should have benefitted from Fenway). What does that translate to in Citi? He reminds me of Jeff Francouer in that he had a great rookie year, and people ignored that he wasn’t that guy any more. To answer your question, no, I would not trade Bowman for him. Actually, a better comparison seems to be Curtis Granderson. Granderson is 4 years older but they put up remarkably similar numbers except Curtis walked over twice as many times while striking out almost exactly the same in equivalent plate appearances. I get that the Red Sox traded Lester to get Cespedes but 3 months of Lester at a prorated salary of $13 million is not a huge value to a last place team. As a Mets fan, I would trade neither Murphy, nor Gee straight up for Cespedes, much less the king’s ransom speculated in the post. I agree with you about the Lester trade and about Cespedes’ value. I agree that Cespedes is similar to Granderson. The part about Francouer is that Francouer started his major league career with 2 amazing months, and it took years before people noticed that that was it. Until proven otherwise, I think we should assume that Cespedes’ rookie season is not going to happen again. You think Ryan was that good that he led to the Mets dark ages? I thought he just struck out and walked a lot of guys. Frankly I’d take a healthy Jon Matlack any day – his 1972-75 run was terrific, and in 1973 was better than most pitchers despite a fractured skull. Maybe Ryan would’ve found himself in New York, but I don’t think he liked playing there. Don’t get me wrong – it was a bad trade, but for the most part Ryan was a .500 pitcher not just because he played for lousy teams, but because he walked his way into losses. The Mets would’ve been fine without Ryan if ownership had been willing to pay for offense, but it didn’t. Hmm, that sounds like a familiar narrative. Oh well. In retrospect, it doesn’t seem that bad, but during the late 1970’s and up to 1984, it was a turd sandwich every time Ryan tossed another no-no or struck out 300 batters while the Mets trotted out Pete Falcone, Kevin Kobel or John Pacella. The Ryan move was also part of series of Reverse-Midas-Touch trades the Mets made over a roughly 10-year period. The loss of those three was worse than the loss of Ryan in the short run – the Mets pitching remained so good in the wake of the Ryan trade that in 1972 they finished 10 games over .500 without a single player amassing 100 hits (strike-shortened season, but the most anemic team performance in modern history). And the ’73 rotation was probably the best in the majors. Ryan in his prime would’ve been a huge plus in ’72-’73, but more than anything they needed bats – just like today’s team. Fear of failure is the worst mental state to be in when walking onto a ball field or building a baseball team. The Mets failures in the 70’s were more about having the daughter of the owner make bad decisions and a GM not aggressive enough. What are the chances of this being repeated this off season (I say rolling my eyes). The Angels made a lot of mistakes the past few years. Does that diminish the fact they had the best record this year? Maybe I am overly optimistic, but I think standing pat with the developing team and signing a massive outfield bat (which I am not naive enough to think will happen) would lead to a playoff team next year, assuming Duda repeats, Granderson improves at all, Flores is above average, and Wright and d’Arnaud can come back. A lot of moving parts, but none of them, short of a big bat signing, seems unreasonable. I don’t disagree. And I think that relying on the continued linear development of some of these new players, while risky, also brings the best chance for reward. As an earlier post points out, the Mets let go of some pretty decent players like Singleton and Otis, (although Singleton netted Rusty Staub) who went on to have good careers. Go back 12 months ago and I think you would be hard-pressed to find anyone willing to hazard the guess that Duda would hit 30 HRs or that Familia, Black and Mejia would have stabilized the bullpen. Imagine the tone here and elsewhere if Duda hit those homeruns in another uniform. I am less credulous about the FO’s ability to make any kind of move beyond the scrap-heap pickup and I seriously doubt the Wilpons will authorize a big ticket acquisition. The lack of activity the past few off-seasons drove me crazy, coupled with Alderson’s unfunny comments and Jeffy’s general smarminess. At this point, I would rather they stand pat than bring in an expensive project or swap multiple prospects for a single player. I am not for one year of Cespedes unless the Sox accept B-grade prospects, which they won’t. The better “obtainable” trade target would be Joey Bats on Toronto. He is signed for $14 mil next year, plus a team option for $14 mil in 2016. He is coming off a big year and fills the biggest need, a RH power bat that can play RF. Now, the cost may be very high…Colon or Gee isn’t getting this done. But, if Niese, Murphy, and Montero could, I’d do it. I would prefer to keep Murphy and go with Flores/Tejada at SS, but Toronto needs a 2B and I’d rather keep Flores and Hererra. Bautista’s bat would lengthen the lineup for sure. If Toronto requires more I would move on the a guy like Cuddyer. No thanks on Cruz or Ramirez. Overall, I’d prefer to preserve as much prospect depth as possible while finding a professional RH bat and SS that can field and be a tough out lower in the lineup. Pitching-wise, they need to add a quality lefty to the pen so Collins has two southpaw options…let Edgin, Rice, and Leathersich battle it out for the other spot. The mets offseason seams pretty simple to me. They must outbid and get Thomas (15 -20 a year) and deal Murphy and Colon. Then they must get a defensive SS to compete with Tejeda and Flores, and thats it. They lose no prospects and they pretty much stay at the same salary level. That doesnt sound that bad does it? Or better yet, get Hardy at 10 mm and leave Flores at second. I have a suggestion for an off season debate. Should the Mets extend Matt Harvey, buying a year or two of his free agency? I know it is not normal to extend a player so early in his career, but considering the Met’s financial state and Alderson’s dislike of large second generation contracts, this might be the last chance for the Mets to keep Harvey past his free agency years. It reminds me of the Jose Reyes situation. In 2010, the Mets chose not to extend Reyes. Instead they decided to see if Reyes could bounced back in 2011. He did and by doing so, he priced himself out of the Met’s budget. However, if he had a poor year, then the Mets also would not of resigned him because he would of had two bad years in a row. Harvey is coming off TJ surgery. He might be willing to sign a new contract to reduce the risk of not bouncing back from the surgery. However, if he does have a good year next year, I don’t see him signing away his free agency years as he has stated his desire to be one of the highest paid pitchers. So if you were the Mets, would you consider trying to extend Harvey now or wait to see how good he really is? Yes, it would clearly be smart for the Mets to extend Harvey now. If they had the opportunity but didn’t act, we could certainly rip them for that. However, they won’t have the opportunity — no Boras client is going to miss a chance to be a free agent while still in his prime. I agree the chances are low that Harvey would agree to it, especially since the chance of the Mets overwhelming him are slim. However the chances of extended him are slimmer if he has a bounce back year. If I was the Mets, I would hope that the injury might put doubt in his mind. But then again, considering Harvey’s personality, he most likely is confident he will be just as good. According to reports, the Mets will non-tender Tejada and give the job to Flores. One reason is to save room on the roster. The other is to save money. 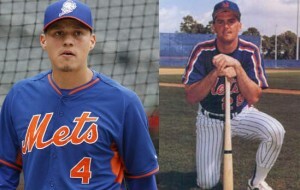 How ironic is it that all these years most have been wanting Tejada gone and now we might regret it? The Mets need a solid backup for Flores in case he doesn’t work out but it looks like the Mets will look for a backup cheaper then the $3 million Tejada could make in arbitration. I think there is a good chance we will miss Tejada (as a backup) if he is not kept. Tejada didn’t do anything well enough for us to miss his ability to do that thing. In past offseasons, there’s usually been some SS floating around who’s a better fielder than Ruben; I hope that’s the case again this year. In my opinion, the best thing for Ruben would be to play every day at AAA somewhere and work on his game. At 24, I doubt he’s completely maxed out his potential. At the same time, I don’t foresee much improvement as an MLB part-timer. I imagine some team out there with roster space will pick him up to compete for a 2015 middle infield job. If he loses, then he’ll probably be sent to AAA. Then maybe he’ll improve, and we’ll eventually regret the loss. No way it was gonna happen here, though. Would he really make $3 mil in arb.? $3 million is the number I read. You are right in that Tejada is replaceable. I am just afraid of who they replace him with. I bet the Mets see this as a perfect spot for a minimum wage player who could be worse. If Flores fails, this is a major hole. When people say you don’t need to spend money on free agents to win, they usually point to $100 million players. However the difference between low revenue and mid revenue teams are the backups. Mets always seem to have minimum wage backups and then blame losses on injured starters. Definitely true, but superior back-ups seem to emerge from potential regulars, and it seems to me that only winning teams lure potential regulars into back-up jobs. Chris Young would have been a fine acquisition as a back-up, but the only way the Mets could get him was by offering to make him more than that. Last season I was interested in Clint Barmes for his defense. He signed a $2 mil deal to return to Pittsburgh and compete with Jordy Mercer. Do you think if the Mets had added $3 mil to their budget and out-bid the Pirates, Barmes would have come here to compete with Tejada and Flores? I guess it’s possible, but I kinda doubt it. In such nebulous circumstances, I imagine the player does care about wins and losses. I’m sure we could have got Barmes for $5 mil, but drastically overpaying a bunch of marginal guys to build a better bench doesn’t seem like the best use of assets. I’d rather buy a star and cross my fingers with the back-ups. We’ve seen enough of Ruben to know what he is and what he isn’t. If it was my team, and money was not an option, I would not have him back for anything over $1.5 mil. That said, I agree with you main point. It is just as important to eliminate dead weight/weak links in every one of the 25 roster spots, and as an extension of that, the 40 man roster. Sure, the 40 man is used to protect some good prospects that aren’t ready yet, but each position is precious. On the big league team, those 25 all need to be contributors, and provide at least one plus skill. Ruben is stuck being middle middle offensively and defensively. I can live with him on the roster, but if they can do better for less cost, do it. Bring back Omar Q. on a MLB-minimum deal. Isn’t that what they do every year, anyway? Ruben’s future is to be Omar Q. anyway, right? Imagine a 12-man pitching staff, with 3 floating relievers who can be used for short stints at any time, and 9 guys whose job is to pitch ~3 innings every 3 days. – You don’t have to pay a single starting pitcher. It’ll be a while before arbitration rates catch up to a brand new role. – Your 3-inning guys will average 45 pitches and then 2 days of rest. I believe Joe has indicated this is something the arm can handle. With no throwing on those 2 off days, this will actually be better than the current starting pitching regimen of “rest for 4 days but not really”. Plus, they’ll get the benefits of increased command that many guys attribute to frequent pitching. And, for anyone worried about innings totals, none of these guys should top 165. – No opposing hitter will get to face the same pitcher more than twice in a game. – Since the manager knows a substitution WILL happen, he can go about it strategically. Leaving a guy in so long that he’s not available 3 days later would not be an option. Maybe that’s 11 outs, maybe it’s 7. – If your 3-inning guys only get you to the 8th, that’s what you have the floating relievers for. Or if your second 3-inning guy tires before you want to bring in your third 3-inning guy, use a floating reliever to bridge the gap. – If someone is ineffective and needs to be replaced, it’s a lot easier to find a guy on the scrap heap or in AAA who can get you 9 outs than 20. – In each game, you can order your three 3-inning guys however makes most sense for that opponent. Alternate left and right / hard and soft, or put the worst match-up last so you can yank him for a reliever, etc. How would this work out? Well, the big hurdle is that currently, few pitchers are conditioned this way. The Mets would have to start in the minors. The second hurdle is that there are fewer places to hide a weak link: even if you don’t need a single ace, you do need 12 guys who are decent, as opposed to current staffs whose 6th or 7th reliever might be a scrub for emergencies only. The big benefit is that just about every pitcher alive is more effective in short stints, and just about every hitter alive benefits from seeing one pitcher several ABs in a row. That looks pretty sweet, doesn’t it? Does anyone think that Familia, Torres and Mejia can’t throw 30-50 pitches in an outing? I bet they can. I like that idea a LOT. Best thing is that if the pitchers are relegated to 45-outings and two days’ rest, they’ll be more likely to actually take off those two days as they’re supposed to. Bravo! Let’s institute it! intriguing idea, but who gets the victory when a game is won? There could be a whole of complaining……. If the first guy leaves with a lead but doesn’t go 5, the official scorer usually awards the W to the second guy. I think the rules allow him to give it to whoever pitched best, though. not only arbitration money, but pitchers chances of winning 15-20 games and looking for big free agency cash……… might keep some pitchers from signing with Mets and will keep some from staying………. Well, I figure it’d have to start with youngsters, for whom FA is a ways away, and the team has a lot of power over them. The goal would be to introduce this usage in the minors, and earn buy-in along the way with improved performance and reduced injuries. If the team were really sold on the injury-prevention benefits, it could put its money where its mouth was and sign some 3-inning pitchers to long-term deals. That’d get everyone’s attention, I’m sure. Also, the 3-inning role might appeal to aging FA starters who are having trouble finding jobs. Someone like Joe Blanton, whose velocity is poor but might have enough pitches to trick hitters once through the lineup. Baseball doesn’t really have a niche for such guys right now, as every GM wants a bullpen full of situational strikeout artists.